Hours: This course is three credit hours and consists of three 55-minute lectures per week (mine were Monday, Wednesday, and Friday from 10:20 to 11:15). Outside of class I spent an average of 30-45 minutes per week on this class. 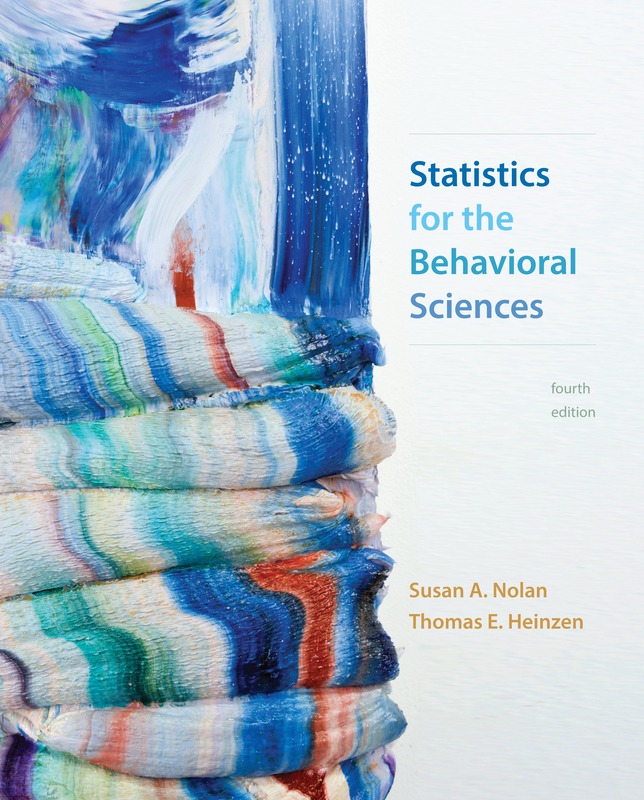 Textbooks: Our required textbook was Statistics for the Behavioral Sciences (Fourth Edition) by Nolan and Heinzen. We are assigned to read a chapter from the book about once a week, and the sections usually aren’t very long. I bought the online version of the text (offered through Macmillan Launchpad), which has helpful features for each chapter like videos and practice quizzes. I don’t usually watch the videos, but I take the practice quizzes as part of my exam prep. You could probably get by without reading the textbook, but I do recommend reading it. I personally like the online version because it’s one less textbook you don’t have to carry around. However the online textbook, isn’t required, so print is fine. Style: Dr. Miller’s lectures consist primarily of Powerpoint presentations, but he hands out review worksheets at the end of every couple chapters, which you complete in class. These are super helpful! Dr. Miller is a fantastic professor because he is always stopping to ask whether students have questions, and he presents the information in an thorough, organized way that is easy to understand. Dr. Miller is one of my favorite professors this semester!There are three midterms and a final, and all exams are multiple choice. In addition, there are homework assignments on Carmen (formatted like quizzes) due about every other week. These assignments are open-book, open-note and have no time limit. However you can only take the “quiz” once, so once it’s submitted you can’t go back in. Why I took this class: It’s a minor requirement for Psychology— I’m working on my minor in Social Psychology and Personality! Comments: This class is basically a statistics class but taught through a psychological lens (meaning that all our examples and data sets come from psychology experiments or situations). I took AP Stats senior year of high school, which has really helped me in this course! There is a lot of content overlap. Hours: This course is four credit hours— three 55-minute lectures per week and lab once a week. Outside of class I spend about 45-60 minutes a week on this class, and that time is mostly spent completing labs. Before exams I obviously spend a lot more time studying, probably about 8-12 hours total. Textbooks: Our required textbook is Understanding Weather and Climate by Edward Aguado. The syllabus recommended the seventh edition, but Dr. Montenegro said you could get by with anything above the fourth. I bought the sixth edition for about $20 on Amazon. A lab manual (specific to this course) is also required, which you can get from Barnes & Noble (and only Barnes & Noble) for about $10. It has all the labs stapled together, which is super helpful. You absolutely must buy this since you 100% will need it for class! As for the other “required” textbook, its content is not explicitly on exams. Dr. Montenegro’s exams are lecture based, not textbook based. I was pretty diligent about reading the textbook the first half of the semester, but it seemed to take up a lot of time and wasn’t super helpful for exams. Since then I’ve stopped reading the textbook but reference it for clarification on certain topics. Style: This class is lecture-based, and Dr. Montenegro uploads his slides to Carmen ahead of class. I pull up the document and take notes on my computer, which I would highly recommend. The slides are more supplemental and illustrate examples, but the bulk of the content comes from Dr. Montenegro lecturing. You definitely have to take thorough notes in class if you want to do well on the exams! There are two midterms and one final— all multiple choice questions with a few true/false. Dr. Montenegro will usually add five bonus questions to the end of each exam, and oftentimes he will add a curve. Why I took this class: I needed a physical science GE, and I’d heard good things about this course and professor. I’d knew of some other science GE courses (geography of national parks, for example), but I thought learning about weather might be interesting. Comments: I honestly think this is my favorite class this semester! I have a difficult time taking a class like chemistry because I don’t like studying things I can’t see like bonds or chemical compositions (I understand chemistry is more than this, it’s just not my favorite!). However I’ve always been fascinated by the weather and learning more about common weather processes has been fascinating! Location: Online! I would highly recommend taking this course online because our quizzes and exams are open note and open book. I’ve been told the exams of the in-person sections of this course are not open note or open book. This was the first online class I took, and I honestly love it because I can do the work on my own time. Dr. Matthews still holds in-person office hours, so you can always go in for help if need be. Hours: This is a three-credit-hour course is three credit hours and consists of two 55-minute lectures per week (mine were Wednesdays and Fridays from 11:30 to 12:25). Outside of class I spent an average of 30-45 minutes per week on this class (not including writing the three papers)! Textbooks: Our required textbook was A First Look at Communication Theory by Em Griffin. I rented it off Amazon for about $40. I started out the semester reading the chapters, but since this class is on theory the textbook is pretty dense. Dr. Matthews goes over everything in his online lectures, even the information you need to know from the textbook. Some chapters are scanned PDF’s from another textbook and uploaded to Carmen. It would probably take me over an hour per week to read the two or three chapter usually assigned. In my opinion the textbook is not 100% necessary to get an A in the class! Style: Each Monday Dr. Matthews posts the lectures for the week online. I download the slides and take notes as I watch the recorded lecture. Dr. Matthews goes through the slides almost verbatim, so I take very minimal notes. The slides are jam packed with information! Typically there are two or three lectures each week, which cover the assigned reading. They’re about 30 minutes on average. In addition to watching the assigned lectures, we have a ten-question reading quiz each week, which covers the content discussed in lecture. Then there’s either an engagement activity or study-guide essay questions, which we post on a discussion board in Carmen. All of our weekly assignments are due by 11:59pm on Sunday night, though I usually try to do my work as early in the week as possible. Finally we have three concept maps due throughout the semester, two midterms, and a final. In your concept maps, you’ll dive into one of the theories and find real world examples. As I mentioned before, exams are open note and open book! I have found them to be extremely manageable. Why I took this class: Comm 1100 is a requirement for all Communication majors and a prerequisite (along with Comm 1101) to declaring your specialization. C-REP: Anytime you’re enrolled in a course in the School of Communication, you have to participate in research studies through C-REP. You’ll get a packet of expectations along with your syllabus, so as long as you follow these instructions, you’ll be fine. You can complete studies online and/or in person. Comments: Given the name of this course—Communication in Society—I expected it to be more about how communication technologies have impacted societies. Comm 1100 (History of Communication) was a lot more like this. I personally preferred it to Comm 1101, but that’s only because I enjoy studying history more than theory. That being said, it’s definitely an interesting course and has taught me a lot about the different ways to approach situations. Dr. Matthews does a very good job at explaining concepts and providing examples. The workload is manageable, especially if you’re able to budget your time well with an online class. I typically sit down and do all the work for the week in one sitting (watch lectures + take quiz + respond to weekly activity). I would highly recommend taking this class online if you are able! Hours: This course is five credit hours and is held five days a week for 55 minutes each day. Outside of class I spent an average of 45—60 minutes per week on homework and/or studying. Textbooks: There are two required textbooks for this course: Reading Latin Text and Vocabulary and Reading Latin Grammar and Exercises by Peter Jones. I used these same textbooks last semester and will again next semester (which I didn’t know before I rented them). Don’t do what I did and rent them from Barnes & Noble! Buy them on Amazon to save money! I bring these textbooks to class everyday and use them for most all of our homework, which is usually either reading a passage, studying grammar, learning verb forms, or reviewing for a quiz or test. I also use a notebook (Ekaterina doesn’t let us have laptops out, which is honestly works really well) during class to take notes. I also complete homework in my notebook unless we are submitting it on Carmen. Style: Class varies day-to-day, which I like because it doesn’t get boringly repetitive. Sometimes we read aloud and translate (each student in the class takes a sentence, and Ekaterina coaches us through it). Other days we learn grammar or come up with our own sentences in Latin and write them on the board. We have small quizzes about once a week and usually have one test each week also. Smaller quizzes tend to be on grammar forms and vocabulary, while the tests combine everything we’re learning, including grammar and site passage translations. Why I took this class: College of Arts and Sciences majors have a foreign language requirement, so I chose Latin because I took it in high school, and I enjoyed studying the language and the culture. Comments: Ekaterina is very organized and fair with grading. My class has only about 12 students, which is really helpful when learning a language because you can get one-on-one help and attention. Ekaterina knows Russian, English, Latin, Greek, and maybe more; she is good at challenging us in the classroom without slamming us with an unreasonable amount of work.